QUEZON CITY -- Sugar stakeholders in the country is crafting a collective position on various issues and concerns hounding the industry, including the proposed import deregulation, for the perusal of President Rodrigo Duterte. Agriculture Undersecretary Segfredo Serrano, who spoke at the opening of the two-day Sugarcane Stakeholders’ Summit at the Bureau of Soils and Water Management Convention Hall in Metro Manila on Monday, February 11, said that the summit is the venue to talk about the status, challenges, and future of the sugar industry. Serrano said sugar industry stakeholders have to plan and come up with a common stand, instead of having different versions of the matter. The summit was attended by about 200 stakeholders including block farms, agrarian reform beneficiaries (ARBs) and workers, planters federation and associations, sugar millers, refiners, bioethanol producers, and bagasse-based power generators in the country, including those from Negros Occidental. Spearheaded by the Sugar Regulatory Administration (SRA) and Department of Agriculture (DA), the first day of the activity included plenary sessions on benchmarking analysis with Thailand, globalization and liberalization of sugar, and presentations of climate outlook and crop estimate, sugarcane roadmap 2020 targets versus Sugar Industry Development Act (Sida) accomplishments , and Sida budget and utilization. On Tuesday, February 12, participating stakeholders will finalize and present their outputs from Monday’s discussion of issues and concerns. A consolidated output will be presented to Sugar Board chairman and Agriculture Secretary Emmanuel Piñol, who will be attending the summit on Tuesday afternoon. Serrano said Piñol has committed to discuss the matter before other members of the Cabinet, at the very least with the President. He believed that Duterte knows the “situation” of the sugar industry and that they are optimistic and confident that the latter will listen. “We, in the industry, along with the DA and SRA may have a contrary view to those who would like to completely deregulate the industry,” Serrano said, adding that the President gave a venue to rice farmers when they have problems with the rice tariffication bill now up for Duterte’s signature. The agriculture chief, in a video message, said the industry is currently facing a challenge as there are forces pushing for the sugar import deregulation. There is a need to prepare thus, stakeholders have to come up with a cohesive plan to be able to survive the industry, Piñol added. Prior to the summit, oppositions have already been raised against the proposal of the government to deregulate sugar importation. In fact, labor groups in the province have already signed two manifestos expressing their strong condemnation to such a “deadly” policy. Even the Senate has already backed such opposition by passing a resolution last week calling on the Executive Department to abort such an “untimely and irrelevant” measure in order to safeguard the economy and welfare of sugar farmers and workers in 28 provinces in the country including Negros Occidental. These oppositions stemmed from the pronouncement of Budget Secretary Benjamin Diokno that there is a need to “relax” the rules on sugar importation that puts pressure on the domestic economy to compete with the rest of the world. Sugar in the Philippines, Diokno said, is very expensive compared with global prices so they plan to deregulate the industry probably this year. Serrano said that after the summit, the next step of the stakeholder-representatives would be talking to the President. 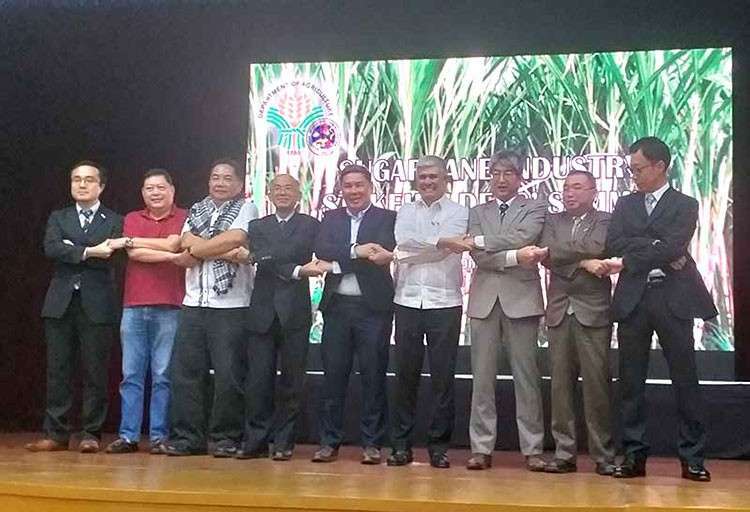 For those in Negros Occidental, for instance, maybe they can invite Duterte in the next big gathering of the sugar industry, the official said. The undersecretary further stressed the stakeholders have to agree how they face the challenge together as it cannot be done by the DA and SRA alone. It’s not going to work if the interest of the entire industry shall rely only on these two government agencies, Serrano said. “You have to be with us, we have to define common ground,” he said, stressing that small producers need to be more productive and cost-efficient in order to survive. For the Philippine Sugar Millers Association, liberalization or deregulation of imports is not sensible for sugar - it doesn’t make sense. Its executive director Atty. Jesus Barrera said that deregulation of sugar imports as it means within the context of the statement of the economic managers is that they will remove the regulatory authority of the SRA. This authority includes classifying imports at the same time requiring importers to secure clearances prior to the release of the sugar from the Bureau of Customs. With that, Barrera said anybody can import sugar at any time whether in peak milling or within the milling season and just pay the tariff and bring the sugar in the country. “The 40 percent tariff that they are proposing may not be enough to cover the situation of sugar in the world market as a dump product. Thus, it will eventually lead to the entry of the massive volume of imported subsidized sugar to the detriment of the farmers,” he added. Under the most favored nation commitment in the World Trade Organization, the existing tariffs are 50 percent in-minimum access volume (MAV) and 65 percent out-MAV depending on the volume. The five percent tariff, meanwhile, is under the country’s commitment to Asean Trade in Goods Agreement. Moreover, Philippine Sugar Millers Association (PSMA) pointed out that prevailing high retail prices do not reflect falling millgate prices. Its records showed that retail prices of sugar in the past six months remain high while millgate prices have gone down since July 2018. Citing the Global Competitiveness Report 2018, the group said the Philippines rank below Thailand in key indices that affect the productivity and cost of sugar manufacturing, at rank 56th and 38th respectively. These indices included road connectivity, quality of land administration, burden of government regulation, research and development expenditures, and quality of research institutions, among others. Other key factors affecting competitiveness are land reform, higher taxes, irrigation, social amelioration, and other workers benefits, it added. In the Philippines, the sugarcane industry covers a broad part of the countryside. There are a total 421,608 hectares of sugarcane lands in 28 provinces. Farm stakeholders are mostly ARBs, PSMA reported. Also, the sugar industry contributes to inclusive growth. About 641,100 individuals are employed by farms and sugar factories. Aside from direct and long-term employment and livelihood opportunities in rural areas, the industry also provides indirect employment through the upstream and downstream industries providing services to the stakeholders, it said. “Given this huge contribution of the industry, there have to be consultations with those affected stakeholders,” Barrera stressed. SRA chief Hermenegildo Serafica, who signed a joint research agreement with Japan International Research Center for Agricultural Sciences on Monday, said the agency is optimistic that the consolidated output will provide Piñol enough tools for the entire sugar industry. Serafica said they hope that the agriculture chief will be able to present to the President such a common stand. Like Serrano, he is “certain” that Duterte will listen. “With SRA together with DA, I know that we can and we should surpass the challenges we are facing now,” he added. For their parts, the two Board Members expressed determination to continue looking for solutions to the problems and challenges threatening the survival of the industry. “It was just 13 months ago, we hurdled one of the most serious challenges to the sugar industry - the high fructose corn syrup. It seems that the enemies of the sugar industry will stop at nothing to kill this particular industry,” Emilio Yulo III, representing the planters, said. Meanwhile, also present during the summit are Confederation of Sugar Producers for Negros and Panay president Nicholas Ledesma, National Federation of Sugarcane Planters president Enrique Rojas and spokesperson Raymond Montinola, and Dan Abelita of Panay Federation of Sugar Workers. Other present sugar industry stakeholders from the province included Minnie Chua of Victorias Milling Company, Timothy Bennett of Philippine Sugar Research Institute, and Wennie Sancho of Save the Sugar Industry Movement. Two former SRA administrators Ma. Regina Martin and Bernard Trebol also attended the summit.